I haven’t written a blog entry in the past few weeks as I have been too tired and too sad to do so. 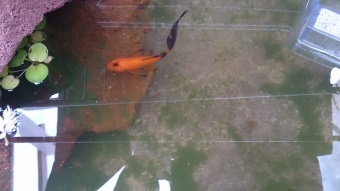 It began about a month ago with the death of one of the four baby fish I bought to add to my small pond. I only had Ned for about a week and he just didn’t do well and eventually passed away. This was soon followed by the death of Loki (another baby) late last month due to mouth rot, and then Dickon, Saturday week ago, from rot around his tail. I tried everything I could to save them – putting them in a separating tank in the pond, antibiotics, water changes…nothing worked. Then, on the 26th October the gorgeous Naamfon, an elephant who arrived after I went to Boon Lott’sElephant Sanctuary in May 2014 and who I was looking forward to meeting, died. Then last week, it was 23 years on the 4th November since my cousin Ben died in a motor cycle accident. He was only 21 years old, and the older I get the more I realise just how young he was. Also on the 4th November I found out about the further tragedies that had befallen BLES the day before. 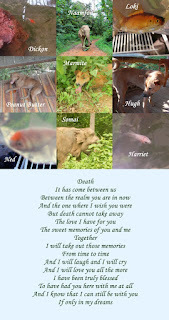 The beautiful bull, Somai, had died, and three of the dogs, Peanut Butter, Marmite, and Hugh (all of whom I spent many happy hours with at BLES) had been poisoned and had died as well – all on the same day. Then, on the 5th November I found my beautiful fish, Harriet, ill in the big pond. Harriet was about eight years old, but always a little delicate thing. She died on Friday morning. 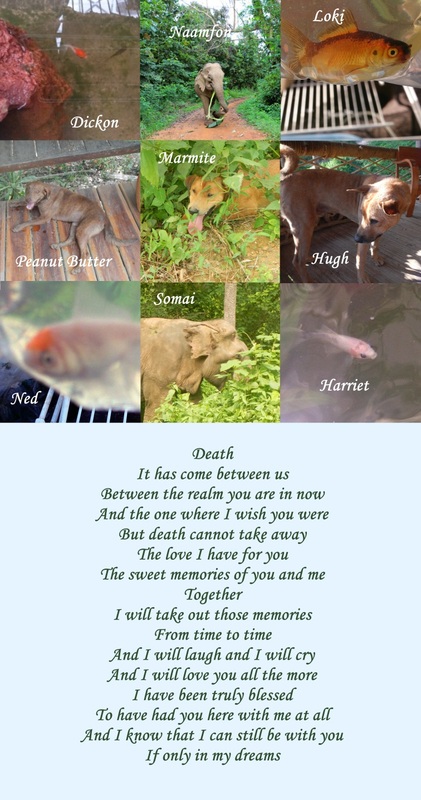 On Saturday, after I buried Harriet wrapped in a tissue, with a bit of plant from the pond, and two bits of food to take with her, I wept and I felt so empty. So much loss. It was, and is, still so much to take in. 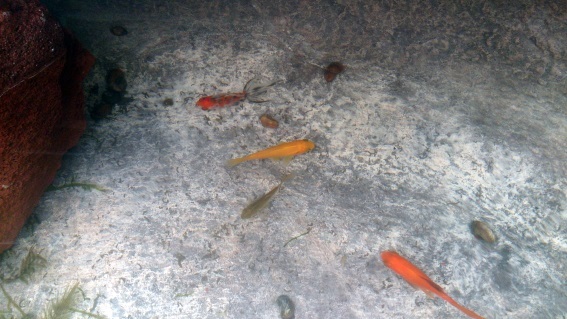 I expect to see my babies in their ponds swimming happily along and coming up to me looking for food. I never imagined going back to BLES and not having Marmite, Peanut Butter, and Hugh escorting me around the place and coming on walks with the elephants. I never pictured Somai not walking sedately and regally along the track with his beloved mahout Phi Sot. And I always expected to meet Naamfon. I’m sorry – I can’t write anymore just at the moment…my heart is broken.